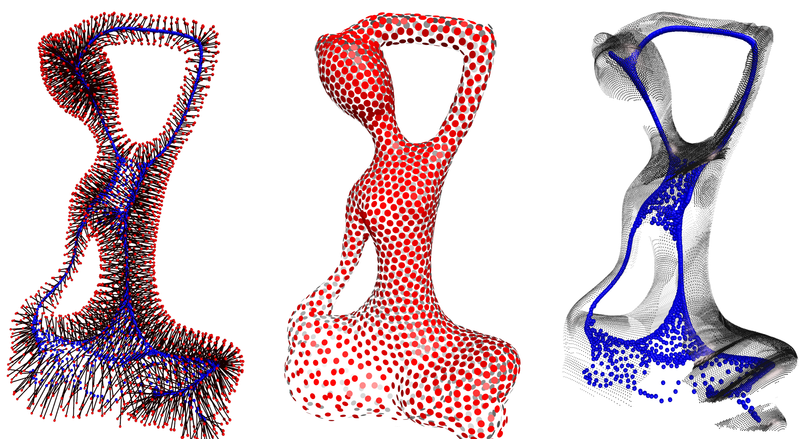 The deep points representation (left) is a set of line sections, each with one end (red) on the surface (middle) and the other (blue) on the meso-skeleton (right). In this paper, we present a consolidation method that is based on a new representation of 3D point sets. The key idea is to augment each surface point into a deep point by associating it with an inner point that resides on the meso-skeleton, which consists of a mixture of skeletal curves and sheets. The deep points representation is a result of a joint optimization applied to both ends of the deep points. The optimization objective is to fairly distribute the end points across the surface and the meso-skeleton, such that the deep point orientations agree with the surface normals. The optimization converges where the inner points form a coherent meso-skeleton, and the surface points are consolidated with the missing regions completed. The strength of this new representation stems from the fact that it is comprised of both local and non-local geometric information. We demonstrate the advantages of the deep points consolidation technique by employing it to consolidate and complete noisy point-sampled geometry with large missing parts.